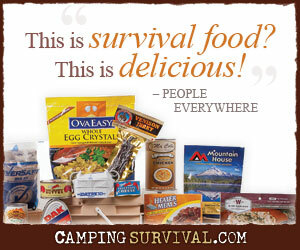 On the final Friday Five from PreppingToSurvive for 2012, here’s what we’re reading: how to defensively use a tactical flashlight, how to talk with your non-prepping spouse about the need to prepare, nuclear programs continue to proliferate as North Korea test fires a long range missile, GMO salmon coming to a dinner table near you, and lawmakers concerned over 3-D printers and guns. Sometimes a person will recognize the need to begin prepping but he/she and their spouse won’t see eye to eye on it. This can create friction in the home. One spouse wants to prep while the other thinks it’s a waste of time and money. What should you do? Ranger Man, of SHTFBlog fame, has jotted down some suggestions for talking with your spouse about your concerns. From SHTFBlog. Most preppers have a flashlight or two in their supplies to help illuminate the nighttime. But you may not have thought about the flashlight as a defensive tool. Brett and Kate McKay of the Art of Manliness offer creative ways flashlight can be used and even what to look for in a tactical flashlight. From The Art of Manliness. Over the past few years, there has been quite a bit of talk about 3-D printers that can create actual objects from downloaded designs. In Texas, a small group of college students claim to have “printed” and test fired a gun. Although, the report isn’t verified, it has some lawmakers concerned. From USAToday. While the U.S. government has it’s attention focused on domestic matters such as the economy and the fiscal cliff, other countries are taking this opportunity to pursue a nuclear program in blatant violation of nuclear non-proliferation treaties. This month North Korea test fired a rocket capable of carrying a nuclear payload to the U.S. West coast. From Reuters. For years, U.S. consumers have been eating genetically modified organisms in the form of corn and soybeans. Now powerful lobbying groups has convinced the Food and Drug Administration (FDA) that mutated salmon that grows twice as fast as ordinary fish is safe to eat as well. From The Independent.